DEFINITION I: The quantity of matter is the measure of the same, arising from its density and bulk conjointly. DEFINITION II: The quantity of motion is the measure of the same arising from the velocity and quantity of matter conjointly. DEFINITION III: The vis insita, or innate force of matter, is a power of resisting, by which every body, as much as in it lies, continues in its present state, whether it be of rest, or of moving uniformly forwards in a right line. DEFINITION IV: An impressed force is an action exerted upon a body, in order to change its state, either of rest, or of uniform motion in a right line. DEFINITION V: A centripetal force is that by which bodies are drawn or impelled, or any way tend, towards a point as to a centre. DEFINITION VI: The absolute quantity of a centripetal force is the measure of the same, proportional to the efficacy of the cause that propagates it from the centre, through the spaces round about. DEFINITION VII: The accelerative quantity of a centripetal force is the measure of the same, proportional to the velocity which it generates in a given time. DEFINITION VIII: The motive quantity of a centripetal force is the measure of the same, proportional to the motion which it generates in a given time. LAW I: Every body continues in its state of rest, or of uniform motion in right line, unless it is compelled to change that state by forces impressed upon it. LAW II: The change of motion is proportional to the motive force impressed; and is made in the direction of the right line in which that force is impressed. LAW III: To every action there is always opposed an equal reaction:, or the mutual actions of two bodies upon each other are always equal, and directed to contrary parts. 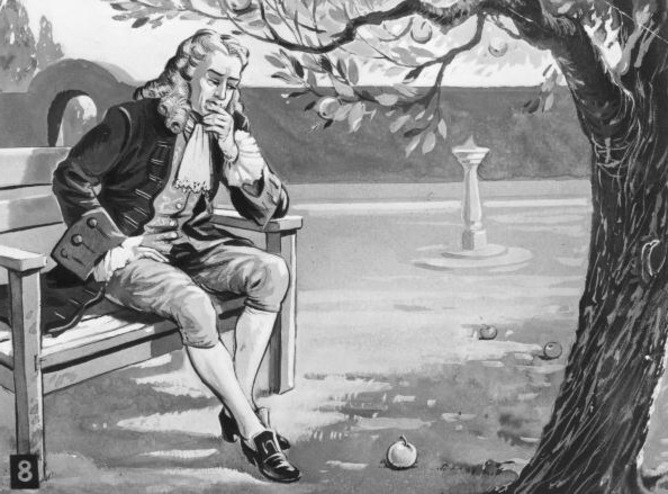 Newton is describing the motion resulting from the action of force impressed upon material objects using the geometry of space. This geometry is used to determine the center of gravity and its motion. Law I – The centre of mass of the system perseveres in its state of rest, or of uniform motion in a straight line, except in so far as it is made to change that state by forces acting on the system from without. Law II – The change of momentum of the system during any interval of time is measured by the sum of the impulses of the external forces during that interval. Inertial frames are undistinguished: any frame will serve as equally as any other. Any resistance to change in motion means that there is substance. The following conclusion may be derived from the basic concepts stated above. This uniform motion of a body implies a balance between gravitational forces in space and the innate forces of inertia. Any attempt to change this uniform motion immediately activates, per Law III, an inertial force to balance the applied external force. Any excess external force generates acceleration. The “inertial force plus acceleration” is equivalent to the external force at any point. A constant acceleration represents a new state of uniform motion. The acceleration, thus, represents an increase in the inertia of the body. The acceleration is relative to the body itself and not to some other body or observer. Thus the uniform motion may be described in terms of inertia of the body irrespective of the “velocity” of some external observer. The greater is the acceleration of a body, the harder it is to increase that acceleration further. In other words, the greater is the inertia of a body, the more difficult it is to move it. When a body has infinite inertia it may be impossible to move it. Its “uniform motion” may then be identified as “absolute rest”. The magnitude of the uniform motion of a body thus increases as inertia reduces from an infinite magnitude. The large but constant velocity of light implies that it has a very small but finite inertia. This inertia is so small that it could not be detected through the Michelson-Morley’s experiment.